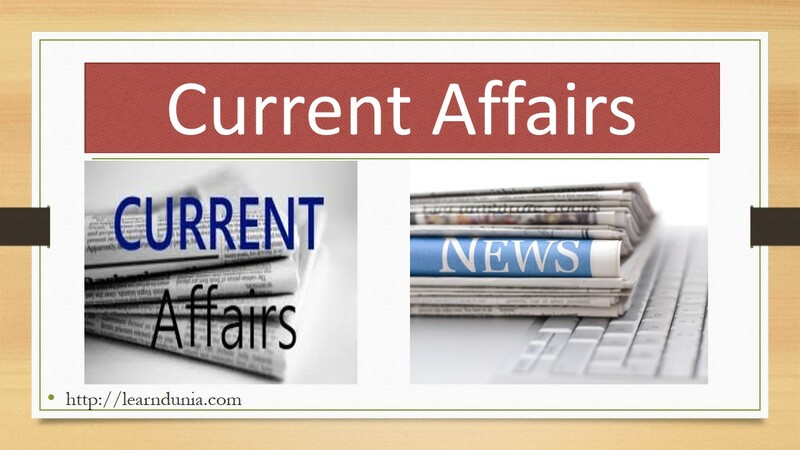 Current Affairs are important for every competitive exams- Bank Po, Bank Clerk, UPSC, LIC, RBI, NIACL, Insurance exams, all state level exams, there are quantity of current affairs questions in the exams, in banking Current Affairs play an important role, and candidates have good knowledge of GA then it would be easy for that. UK PM: Theresa May, Capital: London. At the foundation stone-laying ceremony of an international cruise terminal in Mumbai, Union Minister Nitin Gadkari announced that the Mumbai Port Trust will create the “World’s Largest Garden” by reclaiming 350 hectares of land. Mumbai CM: Devendra Fadnavis, Minister of Road Transport and Highways of India: Nitin Gadkari. Telecom Regulator TRAI (Telecom Regulatory Authority of India) reduced international incoming call termination rate ie., ITC – international termination charge to 30 paise, from 53 paise, to curb the “grey route. The Telecom Regulatory Authority of India said the new rule “shall come into force from the 1st February, 2018″. TRAI Headquarter: New Delhi, Founded: 20 February 1997, Sector: Telecommunication, Chairman: Ram Sewak Sharma, Secretary: Sudhir Gupta. Agriculture Ministers of ASEAN Countries met for the fourth sitting in New Delhi. The Topic of the discussion was biased on “Food and Agricultural Future Development”. On this occasion union Agriculture Minister Radha Mohan Singh seated that India is committed towards the agenda set by United nation and ASEAN countries have been working together for the prosperity of the agriculture sector as we. South Australia aiming to build the world’s largest thermal solar plant.The project is being developed by US company SolarReserve at a budgeted cost of A$650m (£380m), and construction is set to begin this year. Senior Sports Administrator Anil Khanna was named Chairman of the Finance Commission of the Indian Olympic Association, which also formed a four member advisory committee. the committee advisory comprises Tarlochan Singh, GS Mander, S Regunathan and BS Landge. Indian Olympic Association(IOA) President: Dr. Narinder Dhruv Batra, IOA Secretory General: Mr. Rajeev Mehta, Founder: Vijay Kumar Mahlotra, Founded: 1927, Headquarter: New Delhi(India).